THE ROMANY LIFE: Elks Lodge #1913, Ridgecrest, California-Great Stop! Elks Lodge #1913, Ridgecrest, California-Great Stop! Well, it's time to start truly making our way to Albuquerque for the Balloon Fiesta on October 3. We have a long way to go yet, and we don't like to drive extended hours so we have to make a lot of stops. We planned these stops months ago, and it's a lot of fun to finally see them actually happening. Our careful planning and research has paid off (so far) and we have been very happy with every place we have stayed. We have been living off the grid now for a long time, and we were looking for a place to take care of some business; namely, do some laundry and clean up some stuff. It has been very dirty and dusty with all the outdoor playing we have been doing. 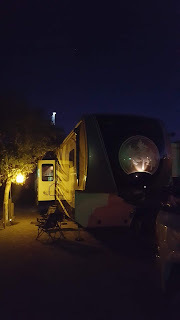 Though our solar has been fantastic for enough electricity, our water tanks only last so long and running the clothes washer uses more water than we would like when boondocking. After an easy haul down 395 to come down another couple thousand feet in elevation, we arrived in the city of Ridgecrest where there is an Elks Lodge that we had targeted. It offers full hookups (YAY! Sewer!!) and 50 amps of electricity (TWO A/C's!!). This is what we were really after... the temps in Ridgecrest are right at 100 degrees every day, and we are not used to that AT ALL. This lodge has a terrific setup, lots of room, and several sites. There were a few RV's there but plenty left for us to pick from. They are all pretty level and have a fine, graveled surface. None offer shade, although a couple have a small tree between sites. We chose one of those. We got setup and filled out one of the little slips at the kiosk outside. The lodge was closed on the weekend. The cost of the site is $20/nightly, so we would square up in the bar on Monday. 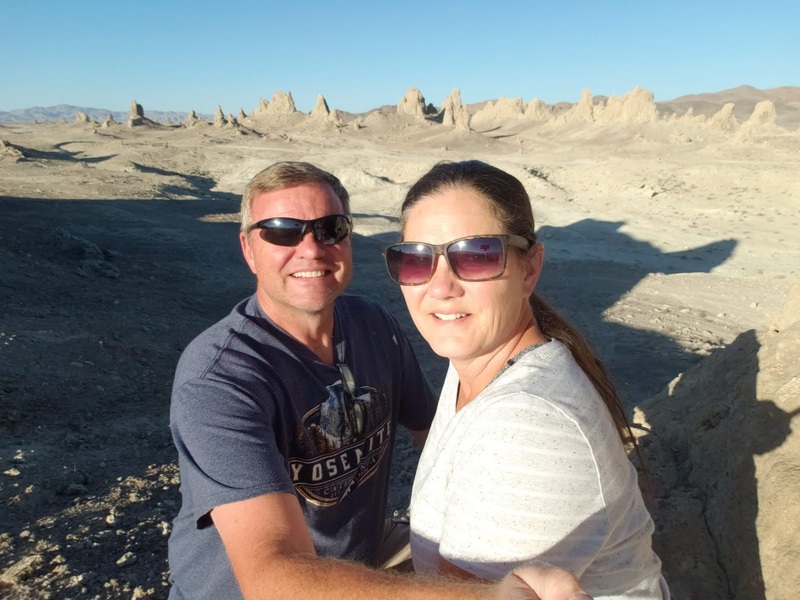 The big benefit of this location is that it is located very near one of the places we have been really excited to explore; The Trona Pinnacles. The Pinnacles are tall calcium spires in a large grouping in the middle of what used to be one of several large lakes about 100,000 years ago. The spires were formed by volcanic springs bubbling up from the bottom of the lake, and the chemical reaction between the compounds caused the deposits to be formed in a pile... now they are these ghostly, other-worldly sculptures in the middle of the dessert, surrounded by BLM land that is free to camp on for up to 14 days. It is truly unbelievable and amazing. Since it was so hot, we chose not to camp near the pinnacles, but to simply drive out early one morning for a bike ride in and around the spires. We wanted to be on our way home before the blazing hot sun got too hot, like about 10 AM. One thing about the dessert, yes, it is a dry heat, so it isn't too bad in the shade, but IF you are in the sun, it is almost unbearable. It's intense on our tender Pacific Northwest Pallor! We got there as planned and parked not too far from the large parking area and single vault toilet provided. We unloaded the bikes and excitedly took off on a really fun exploration of all the different sandy dirt roads that wind through all over the place. You go up and down hills, through the spires and around the area. Most of the roads are easy riding but you can see deep ruts and washouts from when it rained last. I have read the the roads quickly become impassible if it rains and people get stuck out there. I wouldn't want to experience that, for sure. Our electric bikes are ideal for this. We never had any problem zooming up steep hills and between the rocks. The fat tires are excellent for this kind of terrain, the bikes are sure-footed and steady. One of the really great benefits is that they are SILENT. You hear nearly nothing except the crunching of the gravel in what feels like a magical place. I just loved it. Having the bikes allowed us to be very comfortable and see most of the area without really getting tired or hot. We rode for about an hour and half and could feel the air heating up. It was time to go. We had seen most of what we came to see, and were elated that we actually had the whole place to ourselves! Not a single other person there, due to the early hour. It was like being on another planet. We were so glad that we had made the effort to get out there early! Well, time to get ready to move again! We are headed out early in the morning for Needles, California, and another Elks Lodge. Only for one night, because it is even HOTTER there... 107ish each day this week! YIKES! We are going to keep going the next day to Winslow, Arizona where it is a little higher in elevation and finally better temps. Only in the 80's! That will feel like heaven after being in this blast furnace for a week! So we'll check in from there. Yellow ghost light made from a bucket!